Jackson ImmunoResearch is offering the opportunity to apply for a €1000 travel grant to be put towards the costs of attending SfN Neuroscience in 2018! Jackson ImmunoResearch is delighted to offer travel funding to support researchers attending academic meetings and conferences. €1000 is available to attend the Society for Neuroscience’s 2018 annual conference in San Diego California. 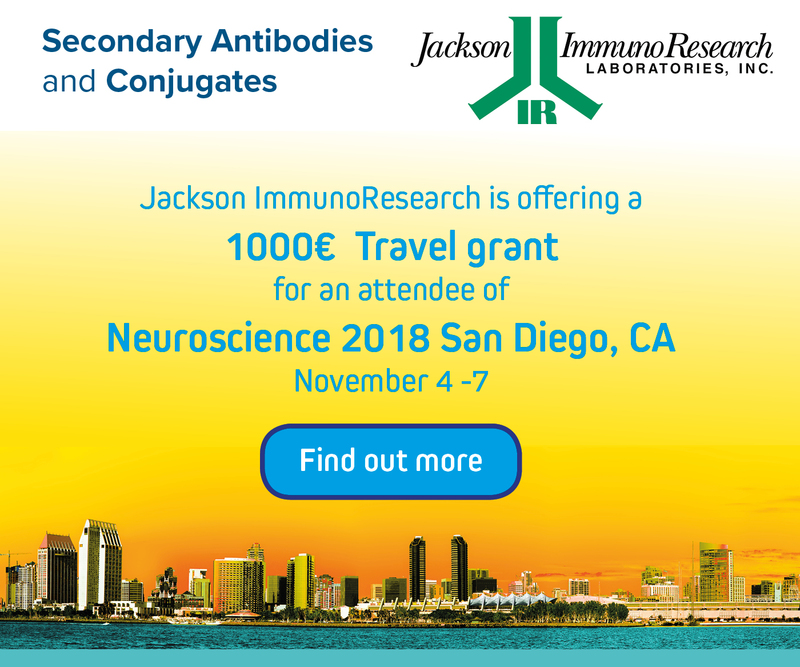 JIR would like to offer a chance to receive a €1000 travel grant which can be used to attend Neuroscience 2018 this November 4-7 at the San Diego Convention Center. To apply for JIR’s 2018 Neuroscience travel grant fill out the application form (here). The successful applicant will be selected by Jackson ImmunoResearch by September 30th, 2018. Proof of attendance is required, see terms and conditions. 1. Travel grant will be awarded to support attendance at SfN Neuroscience 2018 held in San Diego, CA, in 2018 and no other event. 2. All applications must be submitted to Jackson ImmunoResearch using the online application between August 17th, 2018 and October 30th, 2018. 4. Authorship on an abstract/poster presentation at SfN 2018 is not required. 6. Travel grants will not be awarded to employees of commercial organizations (i.e. biotech or pharmacological companies). 8. The recipients will be contacted by email by October 30th, 2018 and also announced online. 10. Attendance at JIR’s booth at SFN 2018 will be required to receive travel grant payment and we request you write a short (250 word) summary of your conference experience.